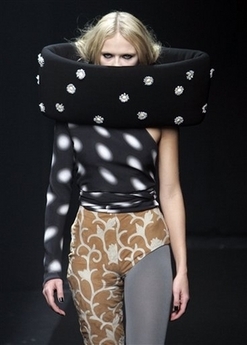 The fashion world has been invaded by Zombie Death Women From Space. Dachew - that was me. I forgot that I only wear the Smurfette costume on the FIRST Wednesday in Lent. A hearty "Amen" to Steve Haller's 12:41, although I must point out that "... he harbored no great ill will for all liberals like Limbaugh." could easily be mis-read. Steve and Richard...When I was a Young Person, I found Buckley annoying and pretentious, but learned to respect the affection he inspired among his many friends from across the political spectrum. Today the paper printed a 2005 "at work in his office" photo which I found quite touching: not only were his organizational skills about on a par with mine (i.e., totally absent), but I clearly recognize an open box of Glad [TM thingie] trash bags on his credenza. Man -- could I relate to that! RIP, Bill. Um, if you follow the link RIGHT NOW, it goes to an interesting picture of Hillary Clinton.